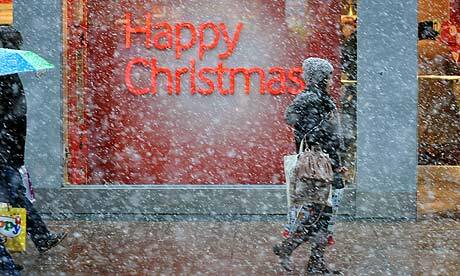 Massive snowfalls (say, like 2 or so inches over the course of the month) destroyed the UK economy during December. Not coalition driven cuts and the incredible damage and futural pessimism that they engender. The chancellor George Osborne, though, refused to change tack despite the evidence that Britain’s economy shrank again. “There is no question of changing a fiscal plan that has established international credibility on the back of one very cold month,” he said. “That would plunge Britain into a financial crisis. We will not be blown off course by bad weather,” Osborne added. Really. I mean, you can see how incredibly snowy it is in the Guardian-stock picture above.